All the bloggers in the Slow & Steady subgroup of the BBA Challenge had a great time making bagels. Going into this round of baking we were pretty evenly split between those who adore bagels - specifically New York bagels - and those who never really cared for bagels, but after baking Reinhart's bagel formula we were all united in how much we loved the tasty results! This time around we've got a few new bloggers baking along with us, so be sure to check out all the wonderful bagel-y goodness. First up this challenge is Audrey of Food From Books (that's her bagel up above) She had some wonderful New York bagels from her childhood to serve as her benchmark; luckily her own bagels stacked up nicely. She lists the lessons she has learned from the BBA Challenge. Find out what they are in her post: Bread Baker's Apprentice #3: Bagels! Cathy of The Tortefeasor found that she was able to produce the best bagels in town - right in her kitchen! These bagels compared favorably to her erstwhile favorites from such bagel hotbeds as New York City and Charlottesville, Virginia. For details, read her post: BBA: Bagels. 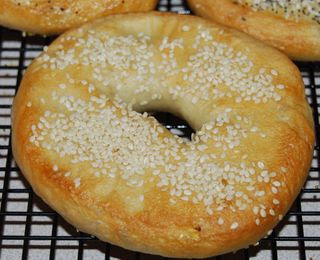 Even though Jessica of A Singleton in the Kitchen is usually not a huge fan of bagels, she found her one hour of kneading to be well worth the delicious result, calling them "insanely good"! Read her BBA: Bagels and Cranberry Bagels . Melissa of From Laptop to Stovetop is not on the BBA blogroll, but she has been following along with the BBA Challenge and baking the breads. 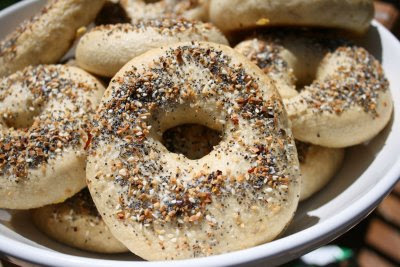 Check out her beautiful bagels on her post: Bread Baker's Apprentice: Bagels! My bagels have been stored in the freezer and doled out gradually. 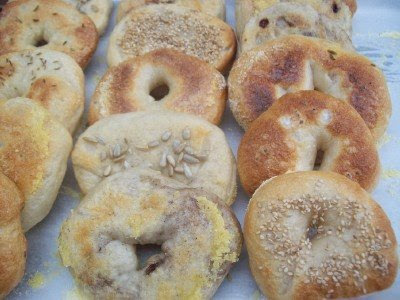 Each one is savored, and I can not believe how delicious the home made bagels are, especially with butter. The bagels were the most fun ever! Can't wait until I can make them again. In the meantime, our next BBA Challenge bread is Brioche. Look for it to be posted on the Slow & Steady blogs around June 28 or 29. And then, on to breads beginning with the letter "C"! Note: If you've asked me to be part of the Slow & Steady subgroup of BBAChallenge and I haven't included you, please leave a comment and let me know. I've had a ton of computer and other logistical issues and may have inadvertently dropped you. Wow - what an impressive group. I can only hope that mine come out as well as yours do. I've read everyone's tips and comments, so keep your fingers crossed for me. Nancy, you are officially a rock star for doing these BBA SOS roundups (of course, you rocked beforehand but now it's official). 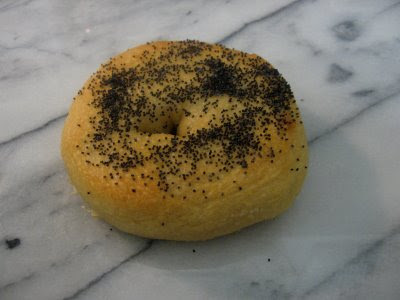 I'm nearing the end of my freezer bagel stash. I shared a few, and I've been faithfully toasting a bagel every morning for breakfast. They're so good -- I'm going to be sad when I toast the last one. But, I did get my barley malt syrup in the mail today so there are more bagels to come. I think that first I need to make some brioche though! Thanks for including me. =) I'm doing okay with the baking part, it's the blogging part that's kind of slow for me. Butter is my favorite too (thought the girls prefer cream cheese). And my freezer stash is about empty, so I'm going to have to make some more soon. Great roundup! Love seeing all the different bagels. I want to make them again. Thank you Nancy ! I love to see all the bagels together in one post !! Such beautiful bagels! You guys are killing me with all of your breads, so I broke down and bought BBA and started reading it this weekend. I can't wait to dive in and see if I can banish my fear of yeast once and for all! OK now I seriously want a bagel. Luckily Sara's parents are making the trip from NY this weekend I am calling in an order. Nice looking bagels. I've got to try the recipe again and see if I can do better. Thanks so much doing this round-up! I love that our group has grown! My bagel is happy to be hanging around with all of its friends. I wish I still had some to dole out gradually...so I'll definitely be making them again!